30-Squares of extra dark individually wrapped squares with a touch of maple sugar. Amedei breaks new ground by creating a 95% cacao dark chocolate with a bold flavor and a touch of sweetness, innovating by using a touch of maple sugar in this intense chocolate instead of conventionally-used cane sugar. Maple sugar is a high quality ingredient with a sweet, sophisticated taste obtained from the sap extracted from the Canadian maple plant. 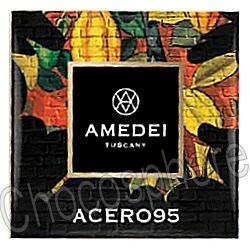 Acero 95 has a light scent but one that opens up deeply once in the mouth. The bitterness of cacao is pleasantly sweetened by the maple which first softens it and then allows you to perceive a symphony of different sensations: hints of licorice, spices and wild citrus. 95% cocoa content. Net wt. 135g/4.76oz., 30 squares.